This elegant dining chair was designed to showcase Designer's Guild's Cassan. The frame of the chair is designed to perfectly match the geometric pattern of the fabric across its curved back; aligning the design from both top to bottom and side to side. 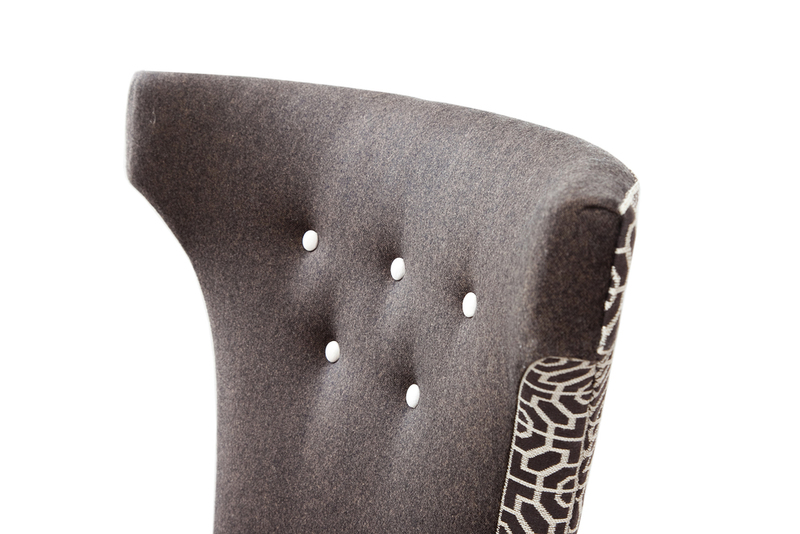 Osborne and Little's Lomond wool fabric was the ideal contrasting partner for the seat and back of the chair with bespoke buttons in ivory silk added for the final finishing touch. This hand made piece and all the furniture made at the Bespoke Chair Company can be built to your bespoke design and specification, using designer fabrics, natural materials and time-honoured traditional techniques. Available to view and buy at our workshop at Applegarth Farm or online. Limited edition of four at £750 each. If you would like to commission a set of dining chairs or other furniture please get in touch to discuss your requirements.